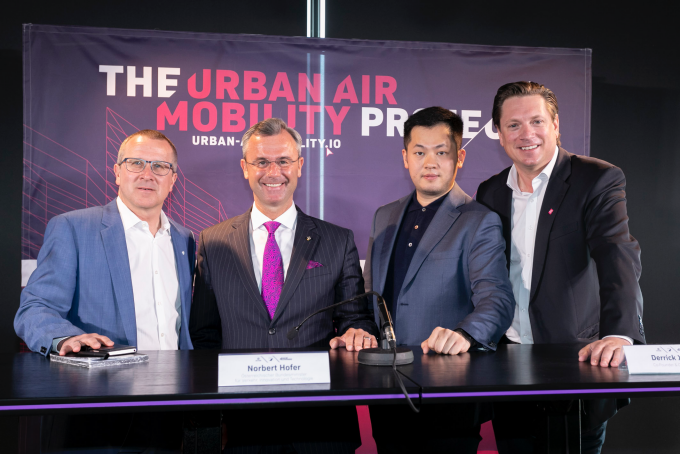 Vienna, 4 April 2019 – the Chinese EHang Air Mobility Group and the Austrian FACC aviation company will take their air taxi to series production in Austria by 2020. At the 4GAMECHANGERS Festival, visitors will experience a European premiere: the first autonomous EHang 216 air taxi will be introduced to the public. 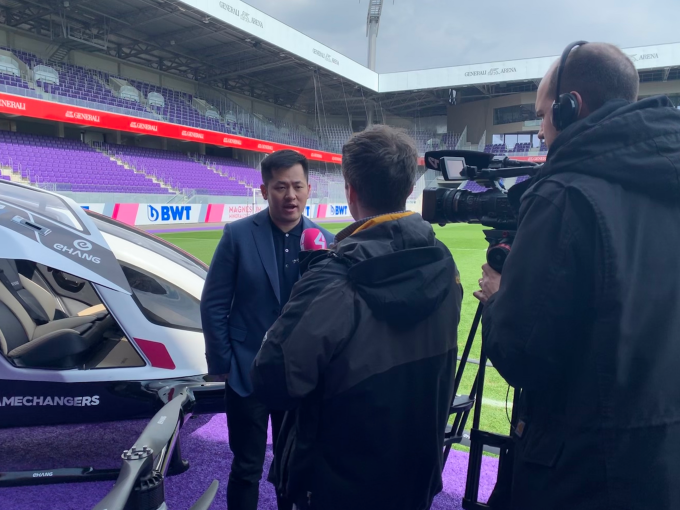 FACC, EHang, and ProSiebenSat.1 PULS 4 Vienna invited media representatives, who enjoyed an exclusive experience of autonomous flight in a vehicle of the future in a secured area, allowing them to form a first-hand impression. Real operation will absolutely require changes to the regulatory framework conditions. 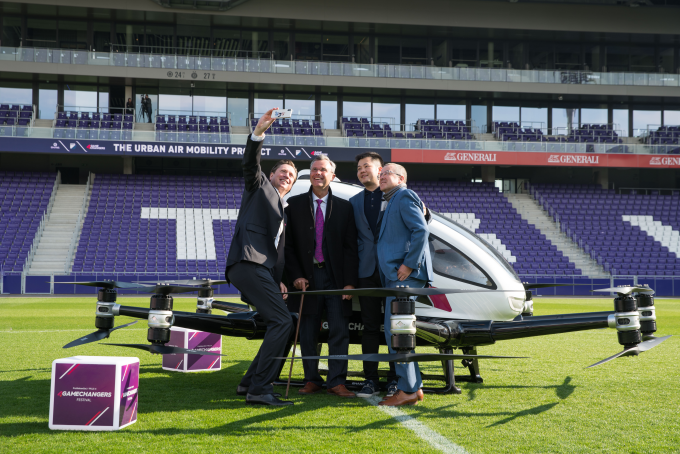 Those who wish to see an air taxi up close for themselves and receive details about these vehicles has an opportunity to do so at the 4GAMECHANGERS Festival from 9 to 11 April in Vienna. Technology: The air taxi is almost ready for series production! “I hope that Austria will be the place where thousands of these drones, of these air taxis will be built and I hope that very soon we will see a lot of these air taxis in the air,” said Mr. Norbert Hofer, the Minister of Transport, Innovation and Technology of Austria, on the press conference. “Autonomous flying will be possible earlier than autonomous driving, since, unlike street traffic, flying involves completely new routes. Autonomous control allows very precise, steady flight,” says Robert Machtlinger, FACC’s CEO. 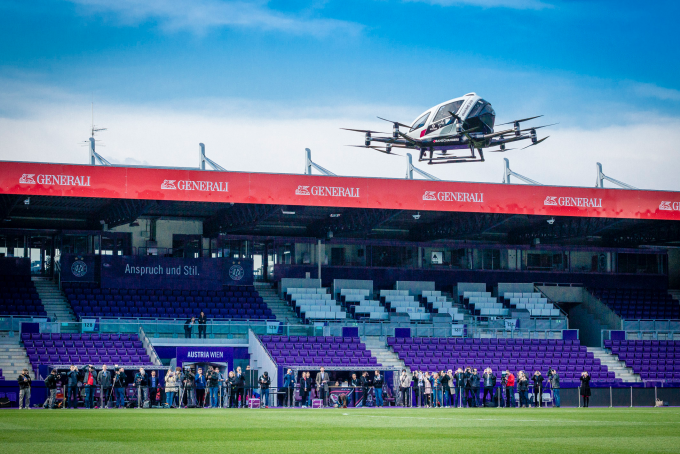 During the preview event in Vienna, journalists were also able to experience the difference between autonomous flight and flight controlled by humans. Robert Machtlinger, Norbert Hofer, Derrick Xiong, Michael Stix on the conference. “The innovative, environmentally friendly drive technology combined with digitalisation allows safe controlling and a completely new flight experience,” Derrick Xiong, Co-Founder of EHang, says of the features of the autonomous air taxi. For the first time, journalists had the opportunity to experience the high-tech, completely autonomous air taxi in operation. The official European premiere will be at the 4GAMECHANGERS Festival, where all attendees will have the opportunity to become familiar with air taxis. “In addition to flawless technology and safety in use, technological innovations require one thing in particular: people have to recognise the utility and trust the new technology. We consider it our task to inform people about new forms of mobility and to discuss them,” says Michael Stix, CCO of ProSiebenSat.1 PULS 4. Michael Stix, Norbert Hofer, Derrick Xiong, Robert Machtlinger with EHang AAV. EHang 216 Autonomous Aerial Vehicles (AAV) are essentially ready for series production; certification procedures are under way. As soon as they are completed, the only obstacles to real flight operation are regulatory ones. Air taxis will be a component of future mobility concepts that is very different from what we are familiar with today. They will make a significant contribution to reducing carbon emission. Further information and photo and video material can be found at www.urban-air-mobility.io.